It’s really sad. Especially when Apple has made it so incredibly simple for us to implement. They’ve done all they heavy lifting for us and simply said, “Carry the baton across the finish line. Please.” And most of us drop the baton. Honestly, it takes minutes to make your application accessible to a population that all too often gets the shaft. I am a fan of Matt Gemmell. Everything from his tweets to his blog. Even if you’re not a fan, I implore you to read just one article. It’ll make you a better software engineer, and you’ll make your software usable to an audience that seems to lack a voice. Must-read for developers. Both a good high-level overview of what accessibility really means and who it helps, and a technical overview of how iOS developers can take advantage of it. 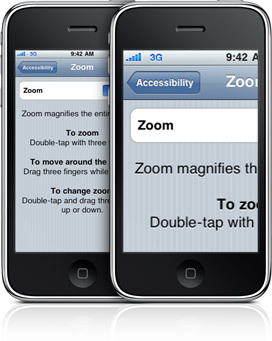 iOS is simply leaps and bounds ahead of the competition in accessibility.